I frequently resolve to write more often. Songs, stories, journals…anything, just get the pen on the paper and see what happens. But just as frequently, I fail. I’ll write a blog entry or two, try a daily journal, and then the resolve fades away and I find myself spending too much energy thinking about writing and no energy actually doing it. So here is yet another resolution to write more often. It’s the new year, a good time for fresh starts and new commitments. And once again, I resolve to write more. And to drink less. Although it occurs to me that perhaps I should actually drink more in order to write more. It remains to be seen. I recently became acquainted with a magazine called The Sun. I’ve flipped through a few copies over the years but didn’t really become familiar with it until we got a stack of back issues from the library. In my quiet existence here on the mountain, it was easy to curl up with an issue and get lost in the stories, essays, interviews, and poems. The magazine is entirely free of advertisements, and I signed up for a subscription. One of the regular features of The Sun is “Readers Write,” where readers are given a topic a few months in advance and have the opportunity to write and submit to the magazine for possible publication. It happens monthly, and that is a commitment I think I can make. So starting in January, I resolve to write and submit for “Readers Write” every month in 2012. I’m going to put them on my blog too, and I’ll let you know if any of them actually make it into the magazine. 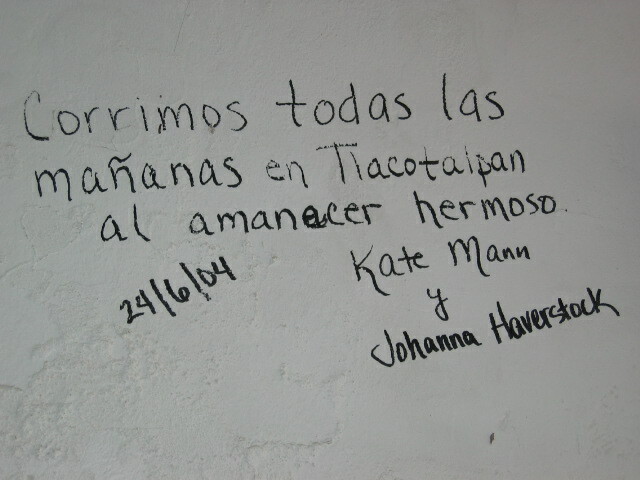 I never experienced heat like that summer in Tlacotalpan. My friend Johanna and I were there with a group of Americans, mostly from Portland OR, studying Spanish for several weeks. I was amazed that the native Mexicans looked so cool in the 110 degree heat with 100% humidity. The men’s crisp buttondown shirts didn’t look wrinkled at all. The women in the shops didn’t sweat. In contrast, we, in our very American shorts and tank tops, were drenched and red-faced and rumpled. When we sat in chairs we were careful not to let any of our limbs touch any of our other limbs, and we drank cold sodas by the gallon. Johanna and I got up an hour before the sun rose every morning to go for a run. It was still warm at 5AM, but not quite so oppressive. We ran away from our hotel, away from the town, and into the nearby rural area. We saw giant pigs, the ice-man filling his bicycle trailer with blocks of ice, houses made out of rusty corrugated metal and rotting boards, and the sun rising against the few clouds that hung in the sky. Johanna was diagnosed with a brain tumor a few years later and died at age 36. I wonder if our inscription is still on that wall. ~ by Kate Mann on 5 January 2012. Hey hunney this is David of David and Russ. We miss you. We will be traveling through your area in June; we want very much to see you. PLEEEEEEEEEEEEEEZE contact me at oldewave@gmail.com. We miss you. We love you. We want to see you. Please respond.